I love clocks, and not the digital kind, the ones with hands and gears. They make that fantastic, soft, ticking noise, and they're one of the most useful decorations that I can think of. 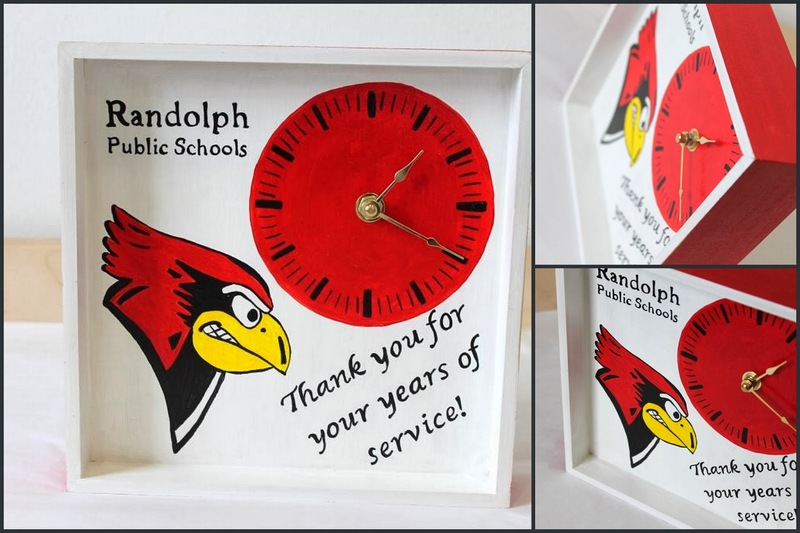 So, when I was approached about making a retirement gift for an employee of Randolph Public Schools, a clock seemed like the perfect idea. I've had numerous ideas for clock faces recently, but I just hadn't yet had the push to actually create one. This was just the push I needed, and I sure am glad of it! The clock is made from plywood, and is the same shape as most of my shadowbox paintings. It can sit on a mantel or be hung from a wall. I decorated the face with a painting of Randolph's tough looking cardinal mascot, and, of course, used the school colors. Perhaps there will be more clocks in my future... If you like this one, I'm definitely open to more custom ideas - just send me an email: tangents.shs@gmail.com for a quote.